The Eunice H. Harrington Award Of Leadership, Service & Advocacy honors the Legacy of the First President of the Women's Division of the Board of Global Ministries of the United Methodist Church. Eunice served from 1968-1972. During Eunice's term in office, the new organization we now know as United Methodist Women was created. 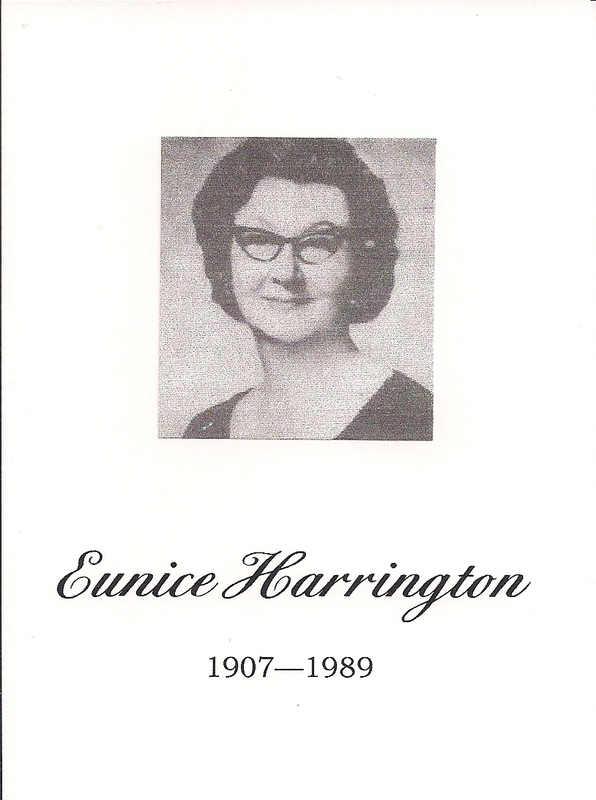 Eunice Harrington of York, Nebraska believed in the power of women to positively impact the world – locally, nationally and internationally. Eunice was a leader, philanthropist and activist who throughout her life sought out and worked for effective solutions to the problems and injustices of her time. This award was first given in 2009. The Award is presented annually to a currently serving District Officer in the Great Plains Conference United Methodist Women who best exemplifies the leadership and work of Eunice Harrington. Email or mail completed Nomination to Lori Collins at 2211 5th Ave, Scottsbluff, NE 69361 by July 1st, 2019. For additional information contact Lori Collins, 2019 Journey in Faith Team Leader. Each District selects a nominee from among its current District Officers. Someone from the District level, who is familiar with the nominee, completes the Nomination Form. District President submits the form to the Conference President. District Applications are reviewed and one nominee is selected by Eunice's granddaughters as the annual recipient of the award. Length of membership in United Methodist Women. Activity in the local unit of United Methodist Women, including assuming responsibilities and encouraging the growth of others, especially women, children and youth. Activities beyond the local unit. Activity in the local United Methodist Church. Activity beyond the local United Methodist Church. Involvement in an organization and/or effort working to improve the status of women, children and youth. Promotes and educates about the human rights of women, children and youth and works to safeguard these rights through her presence and voice. Shows support for the Charter for Racial Justice. Has contributed to the growth of United Methodist Women through her service. The recipient receives a certificate and is recognized at the Great Plains Conference United Methodist Women’s Annual Meeting and at their District Fall Annual Meeting. The recipient’s name is added to the plaque that is on permanent display at Epworth Village in York, NE.